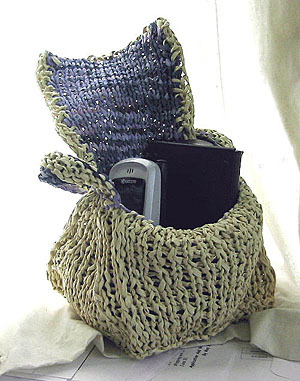 Small purses are fun, raffia is fun - together this is the Doublemint of fun summer purse projects! Lace is also fun, and easier than one might think! Work this up with the lace, or without for a simpler project. 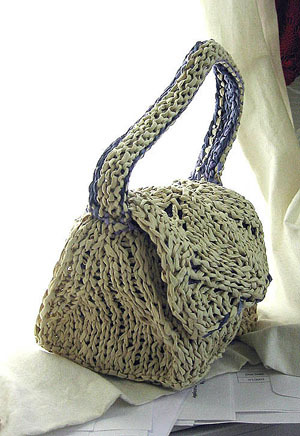 The lining is rayon ribbon and is worked in a mirror image of the purse. With US #10 circ needles and 1 strand of raffia, CO 15 sts. Work in garter stitch for 6 rows. End with a RS row. 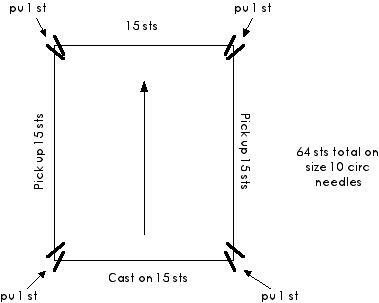 Place marker, *pick up and knit 1 st at corner, pm, pick up 15 sts, pm* three times, pick up 1 st at last corner, place contrasting marker -- 64 sts on circular needle. Position bag so the picked-up selvedge edge of bottom is on the inside and begin working in St st. The last 15 st section that was picked up is the front of the bag. Working in St st, follow chart to create lace pattern on back side of bag and AT SAME TIME slip corner stitches every other row to create a 'turning corner' that will help the bag hold its shape. Work even, following lace pattern for back of bag with no decreasing on the sides for 4 rounds. 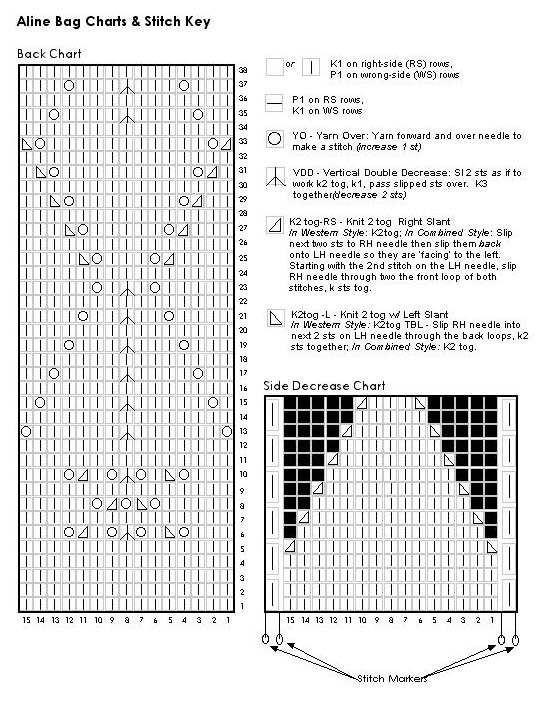 While working back in lace pattern and front in St st beg decreasing at sides as follows: Work 4 rows with no shaping, then beg with row 5 k2tog-LS, K to last 2 sts before marker, K2tog-RS [see side chart]. Continue working both sides in the same manner, decreasing until only 5 sts rem on each side between markers [row 15] -- 44 sts rem. Leaving 29 sts from both sides and front on the circ needle, continue working 15 sts of back on straight needles. Continue following chart to create the back flap of the bag. Work to row 38 of chart. Next row [RS]: Using ribbon, knit. Next row [WS] *With ribbon K1, with raffia K1* repeat to last st, with ribbon, K1. Next row [RS] With ribbon, knit. Continue working in St st in ribbon only until inner flap measures same as outer [raffia] flap at point where sts had been set aside, end with a WS row. Next row: [RS] Using the circular needle, purl 15 sts off of straight needle then continue around bag on circular needles -- 44 sts. Next round and every subsequent round: Knit. Reverse shaping for sides of bags by inc 1 st on either edge of side every other round until 15 sts rem between side markers - 64 sts total. Work even until lining measures 5 inches deep. Next round: [K14, VDD [remove markers]] four times. Next round: [K12, VDD] four times. Next round: [K10, VDD] four times. Continue in this manner until 8 sts rem. Cut ribbon, leaving an 8 inches tail and pull through rem 8 sts. 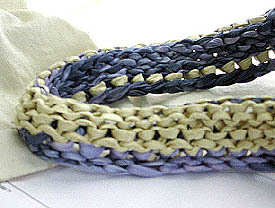 Knot ribbon on WS and weave in end. Depending on the fiber content of your bag, either steam block with an iron on medium heat or wet-block the bag by soaking it, then rolling it in a bath towel and pulling it to the dimensions desired. When bag is blocked, stitch flap lining to sides of outer flap. 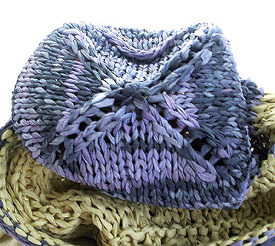 With raffia and US#10 straight needles, CO 56 sts and work in garter stitch for 6 rows. Switch to ribbon and continue in garter for 6 more rows. BO all sts. Stitch bound off and cast on edges together. Block handle in the same manner as bag and stitch in place on either side of flap. Annie teaches locally and nationally and espouses the controversial Combined Method. She blogs and tries to answer all queries posed to her about knitting as long as they're accompanied with kind words and/or a little chocolate. Annie lives, knits and breathes in New Jersey with her husband and kids, where she does a mean imitation of Jane Kaczmarek in Malcom in the Middle (her own personal television heroine - in both senses of the word). Current personal pithy aphorism: "Don't hate me because I knit fast." Pattern & images © 2003 Annie Modesitt. Contact Annie.